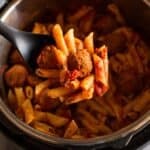 Instant Pot Penne Pasta with Meatballs is a favorite easy meal at our house. It's made with uncooked penne pasta, meatballs and a simple red sauce. Add meatballs to bottom of IP. Add pasta on top, spreading into an even layer. Cook on High Pressure (Manual) for 4-5 minutes (half the time on the box of pasta). Do a controlled quick release when timer beeps. Stir. Allow to cool for 5-10 minutes before serving.